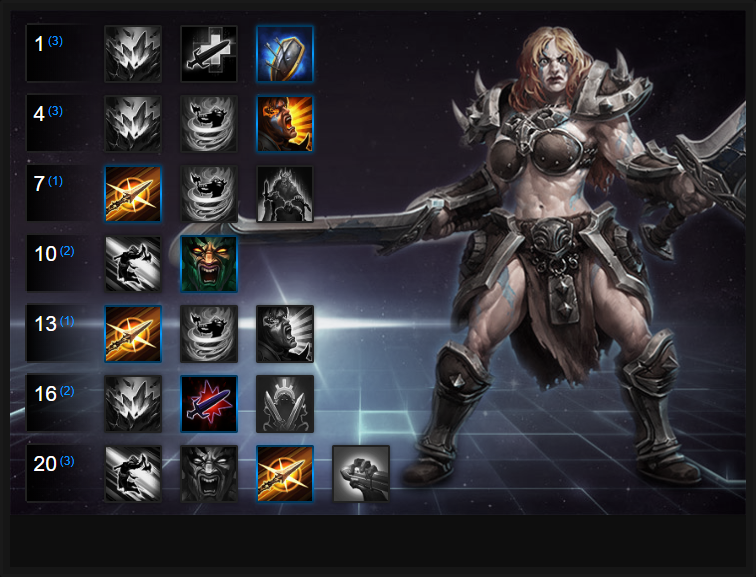 In this Sonya Build Guide, we provide an overview of her strengths, abilities, talents and matchups. Sonya is a flexible and useful Warrior that acts more as a bruiser than a "tank". She's popular for beginners, but she actually has a high skill ceiling and requires a great deal of thought to deal damage, but importantly, stay alive. Even though the game makes her out to be "Medium" in difficulty, I'd honestly say she's hard/very hard to play well. Having invested a lot of time in her, I play her almost exclusively because she's so rewarding if played correctly. With many compositions now consisting of two Warriors, she compliments most teams as the "off tank". With high burst, some mobility and self sustain she's a nuisance and very strong in the right hands. Her ability to stun, solo "camps" and bully lanes makes her an excellent pick. Fury (Trait) – Sonya doesn’t use mana, but instead relies on Fury. This resource builds up as you take or deal damage, which two of your abilities depend on. The important thing to note here is the 10% movement speed you gain whenever you use an ability. If you’re ever attempting to escape, simply activating Whirlwind for the buff, so you can get you to safety, is often enough. It's also worth noting that without Fury, Sonya can't do anything. Relying solely on melee attacks is the best form of generation but Ancient Spear (below) is key to her Fury gain. Ancient Spear (Q) – This functions as your main gap closer, and offers a nice bit of CC as it briefly stuns the enemy it hits. With that said, this is a punishing skill shot to miss. Not only will you not receive the Fury generation, but your main gap closer and easiest form of initiation is now on cooldown. With that said, this won’t always be just an initiation tool to start a fight, as it will often be valuable to save it in order to catch up with a fleeing enemy. Seismic Slam (W) – With virtually no cooldown, Seismic Slam is your main source of damage. It does cost Fury so it can’t be spammed indefinitely. However, when fighting you shouldn’t be afraid to trade damage with a single target due to the sustained output offered by Seismic Slam. The small AoE it provides is a bit of a bonus and few can withstand multiple slams back to back. Whirlwind (E) – Your primary source of wave clear and what you’ll use to effectively clear mercenary camps or regain your health, Whirlwind is formidable. The healing is significant and against multiple enemies or minions, returns tons of health to Sonya. This is especially true in a clumped-up team fight, as healing is tripled against Heroes. If your enemies are standing close together, get in there and start Whirlwinding; you'll be very tough to bring down. Leap (R)– The reasonably long cooldown and low damage of Leap make it often undesirable to many players. What it does offer however is a solid source of initiation against a front-line heavy composition. While Leap isn’t a completely terrible Heroic ability, it is niche and very dependent on the composition you're facing. If it's melee heavy, with a strong back line, then you might want to take it because it allows to dive deep if the rest of your team follow in. I'd also argue it's best used when you've a double tank composition. Wrath of the Berserker (R)– By not taking Leap, you’ll have access to Wrath of the Berserker Heroic ability instead. Not only will this greatly increase your damage output, it also halves the effectiveness of crowd control placed on you. This is incredibly useful for a front-line Warrior, but it’s made even better by the long uptime you get. It’s only on a 45 second cooldown to begin with, and the duration is extended by 1 second for every 10 Fury you gain. If you continually land basic attacks or your Ancient Spear, you can keep up Wrath of the Berserker near indefinitely during a team fight. Tough As Nails provides Sonya with amazing amounts of mitigation. Every 12 seconds she'll gain one charge of Block, reducing basic attack damage against her by 75%. With this stacking 3 times, and its cooldown recharges 200% faster while her movement speed passive is active. Simply put, it makes Sonya very tough. Gaining 40% increased basic attack damage after every Seismic Slam is great. Shot of Fury also provides 50 instant Fury as and when you need it. Whether you're low on Fury, or simply want to burst an opponent for more damage, it's a great Talent. Allowing Sonya to deal 100% increased damage over 4 seconds with her Ancient Spear, Poisoned Spear ensures immediate pressure on any target she hits. While its damage isn't as high as it once was, it's still very strong for opening burst. Variable: For large Battlegrounds where you want to constantly clear camps, take Battle Rage. Offering an instant heal (10% of Sonya's maximum health), Battle Rage has 2 charges, while also giving her 25% increased damage to mercenaries. It's an amazing Talent for sustain and camp clear. The 40% damage increase Wrath of Berserker provides is huge and if used in combat, you can keep it on permanently. The fact it reduces CC by 50% and also triggers your speed boost makes it really useful. For the vast majority of the time and despite its 45 second cooldown, you'll have enough fury to just use it again when it wears off. Variable: Leap if you're after a guaranteed escape ability on a long cooldown or as an excellent ability for engaging. It is however a risky ability to use because it can place you in a position where you don't want to be. Mystical Spear allows Sonya to always pull herself even if she misses Ancient Spear, and it also reduces the cooldown of Ancient Spear by 2 seconds, allowing you to use it more, and also trigger Poisoned Spear that little bit more. Variable: Spell Shield is an alternative some Sonya players take to mitigate damage but in all honesty, its cooldown of 30 seconds just isn't worth it. Rampage grants Sonya 25% increased attack damage (which stacks with her Heroic) while also allowing her to reduce the cooldown on Ancient Spear by 0.5 seconds every basic attack. Granting a 25% increased Ancient Spear range, Composite Spear also grants Sonya 25 armor for 4 seconds when she hits an enemy Hero. For immediate dive defence, it's amazing and plays into all your other Ancient Spear talents. These Hero Threat Levels (1 being lowest threat and 10 being highest threat) are to help you determine which enemy Heroes can give you a headache. Any Heroes that aren't on this list are easy pickings for Sonya. If a Hero is listed here, take greater care. Falstad: If you've a full set of Fury, there's no reason why you can't kill Falstad. You have to hit him first however because his range and mobility is a nuisance. Kael'Thas: Unlike Jaina, he can't keep you frozen, however, he can use Gravity Lapse to incapacitate you and unload all his damage. Kerrigan: Probably one of your hardest matchups due to her mitigation, pull and stun. It's also hard to burst through her shielding when she starts to fight. Muradin: He's obviously tanky and with his Avatar he's particularly difficult to beat, especially if he takes his stun and hardened shield. Nova: If she hits you first, you'll die. If you hit her, she will. There's really very little room for error against her, although if you have your heal and shielding available it's a much fairer fight. Raynor: His self heal can make life difficult and his knockback stops you getting close to him and his allies. The Butcher: His heal from Butcher's Brand combined with Lamb to the Slaughter make The Butcher a real threat. Try to avoid 1 on 1. Tychus: Although you can get close, his mobility whilst firing combined with his grenade make him incredibly annoying. He can comfortably kite you all day long. Valla: Valla's range combined with her damage and vault make her a headache to deal with. She can kite you comfortably and melt your health in seconds. This list of tips and tricks are just a handful of things we think will help your Sonya play. We'll continue to add to the list as required and if you have any tips you'd like to share, let us know in the comments below and we'll place them here. 1. Sonya is difficult to play because her abilities, later game, are her engage and escape abilities. Fury provides her with little to no cooldowns so use them effectively. 2. You should always try to keep your Fury as high as possible at all times. Using Ancient Spear is usually more than enough. 3. Remember that Whirlwind provides more healing against Heroes (triple the amount!). 4. Despite being a warrior, you are still squishy unless in amongst a crowd. Use Whirlwind to heal and escape or your shields if things get too dangerous. 5. Seismic Slam is amazing against groups of Heroes or Minions but is Fury intensive. Try to use it inbetween Shot Of Fury and Ancient Spear so your Fury remains high. 6. If you want to escape as Sonya, use Whirlwind combined with Ancient Spear (with the Mystical Spear upgrade). Alternatively, use your natural speed when using abilities. Finally, if you position yourself properly in fights you'll rarely need to. 7. As soon as you get Wrath of the Berserker you should be keeping it up full time. Hitting lanes, attacking towers or other players - as long as you're building Fury it will stay active. Even using Ancient Spear against structures still builds fury, so it shouldn't be an issue keeping it on for at least 30 seconds. 8. Try to only use your shields when you really need them. They have long cooldowns and can both be used at the same time. 9. Your heal from Ferocious Healing provides a good little bump of health and can be used alongside Whirlwind.